Alchemie « ASACHEM (M) Sdn.Bhd. Alchemie are a U.K. Manufacturer of Epoxy Resin, Polyurethane Resin and Silicone Rubber products. We serve a diverse section of industry, comprising of Formula 1, Automotive, Wind Energy, Electronics, Composites, Rapid Prototyping, Oil and Gas, Engineering, Patternmaking, Mould and Toolmaking. 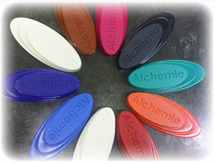 Please visit www.alchemie.com for more information.